Yesterday was a big day in rugby as the All Blacks won the Rugby World Cup for the third time, especially big as they won the last World cup as well. No other team has ever done that. Yet. 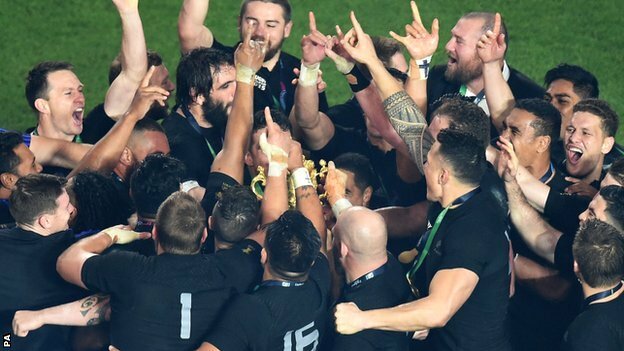 The final was played between Australia (Wallabies) and New Zeeland (All Blacks) and it was the highest scores in a final ever. The All Blacks won it by 34 – 17. And it was a game that had so much rugby in it. Read more about it here. As we were watching the game my husband suddenly said that he liked what the Wallabies coach called his team. He had a group of starters and a group of finishers. And no reserves. The group on the bench were the finishers and they came on and really made a difference. How much a difference thanks to being called a finisher instead of a reserve? I would like to ponder more on that. I have often in my work with teams and groups of people used my knowledge and playfulness from my rugby career, and my upbringing in a family where sports played a role for all. During some of these moments at work I have clearly seen who to pick for starters, but not as much who to pick as finishers. I would like to play around with that next chance I get, to see what else have been right in front of me that I haven´t noticed yet. What will happen in and with the group if I see all in a different light? What will happen when I see the starters and the finishers? Who would you pick from your colleagues as starters and finishers? Who would be in your team?